If you’re letting your young child scoot around the house in an infant walker, stop immediately and throw that walker out. The devices have resulted in hundreds of thousands of injuries to infants, primarily from falling down stairs, and present a significant risk without any real benefit, concludes a new study published in the journal Pediatrics. 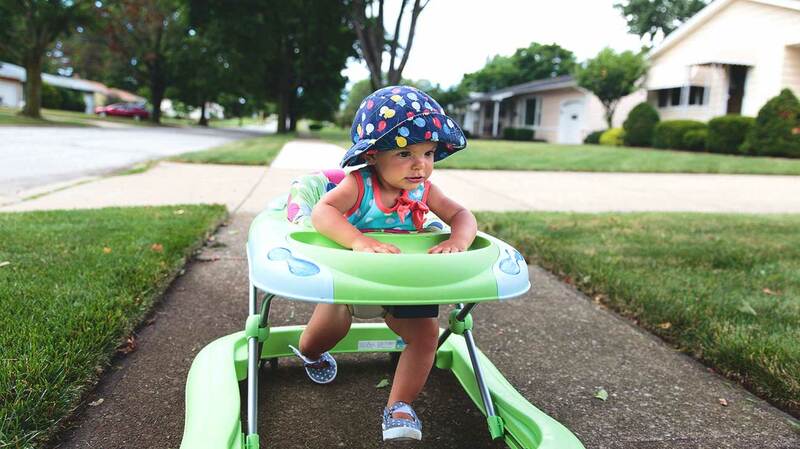 The authors support a complete ban on infant walkers, those plastic contraptions on wheels that allow babies — who are far too young to have independence and mobility — move around on their own. That precedent of a ban was previously established by Canada in 2004. “They are dangerous because they give very young children mobility far before they are able to handle that type of mobility,” said Gary A. Smith, Director of the Center for Injury Research and Policy at Nationwide Children’s Hospital in Columbus, Ohio, and a coauthor of the research. Researchers examined national injury data between 1990 and 2014 and found that infant walkers resulted in 230,676 emergency department visits for children under the age of 15 months. Ninety percent of injuries were to the head and neck and nearly 40 percent admitted to the hospital had a skull fracture. Experts reported the appearance of safety that baby walkers give is misleading: it leaves the head and upper torso of a child exposed, which as the data show, is the most likely place for a serious injury. The most common reason for injury was falling down the stairs, but the authors caution that the devices can expose infants to all kinds of hazardous situations, including falling into pools or giving them access to items like household cleaners or hot liquids. Most of the injured children were extremely young. Experts say that infant walkers don’t provide any functional benefit for developing babies either. Some parents or caregivers incorrectly believe that putting preambulatory infants in walkers will help them learn to walk sooner — but that hasn’t been verified by any factual evidence. According to Smith, muscle patterns that babies use to develop their ability to walk differ from the patterns used when in an infant walker. From a parenting perspective the devices may be helpful by giving a baby some independence and allowing mom or dad a rest. But if parents think they can rest while their child is safely ensconced in a walker, experts warn that’s not the case. Fortunately, stationary activity centers, which have been on the market in the United States since 1994, can similarly entertain children without giving them mobility. Injuries related to infant walkers have declined dramatically since 1990, in some part due to the introduction of stationary activity centers, but also because of increased public awareness of the dangers of the devices and better safety standards. “We really don’t want to relax our push to eliminate this hazard just because we’ve seen a decline [since] we know that these injuries have the potential to be quite serious and even life threatening,” said Smith. Smith and Shapiro both support banning the devices. If you’re worried about proper walking and strength development, Smith says there’s nothing wrong with “good old fashioned belly time” — putting an infant on its belly and letting it learn to move around on its own. “For the history of our species that’s how we’ve developed. We do that just naturally,” said Smith. A new study finds baby walkers have lead to hundreds of thousands of injuries among infants and pediatricians are calling for them to be banned completely. Injuries have gone down in recent years due to stationary activity centers but experts say thousands of children every year are being injured in the walkers.